Posted on September 18, 2014 by Ashish Valentine. The field of digital signal processing specifically relates to machines that can process analog signals like data from a cable or information over a wireless network, encode them into numbers, and then decode the numbers back into analog signals at the end of the process. This form of signal processing can be found throughout our technologically dominated world, as the analog signals from our phone calls are received and converted into audio data for us to hear, Wi-Fi signals are converted in our laptops into e-mails we peruse and respond to, and electrical pulses through cable networks are translated into shows on our television screens. As new forms of technology and media supplant the old, for instance, smartphones replacing home telephones and cable networks displacing satellite dishes, digital signal processing as a field is constantly in flux. 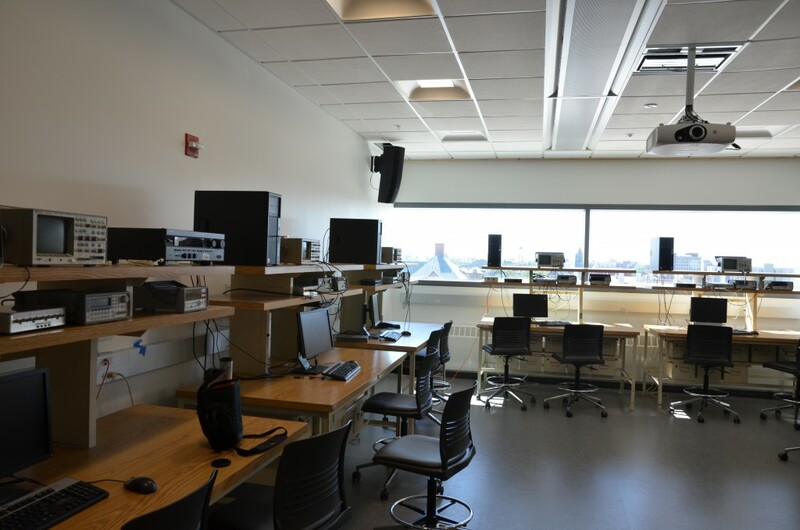 As digital signal processing has changed over the past few years, ECE ILLINOIS has kept up with the times by building the Digital Signals Lab within its new building. The lab itself is stocked with computers loaded with a microprocessor development system for students to gain hands-on experience working with digital signal processors like the Texas Instruments DSP C55x. These devices will allow students to design software solutions on Matlab, a technical computation software, test their effectiveness in a virtual environment, then port their debugged solutions to the lab’s physical equipment to see their work in action. The lab computers are also equipped with a software development platform to acquire, process, and output signals on Android devices so that students can directly develop signal processing applications and test them on their smartphones, or on Google Nexus tablets available for checkout. The Digital Systems lab will be the site of the ECE 420 course, Embedded Digital Signal Processing Laboratory, in which students will apply the theory they learned in ECE 310, Digital Signal Processing, to a laboratory course that teaches them the basics of actually working with signal processing. They will start out learning additional theory, then graduate onto prototyping projects in Matlab, implementing them on microprocessors, and finally tie all their knowledge together by working on independent group projects in software development environments like Android.